Managing Groups in the Syncfusion Dashboard Cloud. This section explains on how to add, edit, delete groups and also on how to assign users and manage permissions to groups in the Syncfusion Dashboard Cloud. Groups is a collection of users to which permissions can be assigned. To add new group to the dashboard cloud, click on New Group in the groups management page. 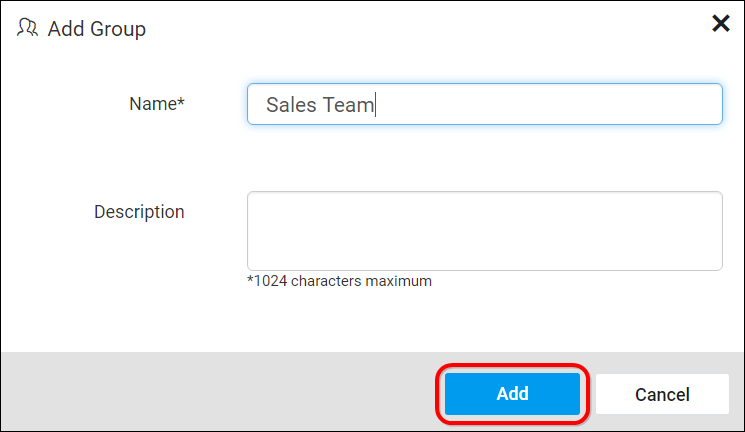 New groups can be added by providing name and description(optional) for the group. Fill the form with name and description and click on Add. New group will be created and you can add users or manage permissions for it. Group Information can be edited from the group’s edit page. Group name and description can be edited in the group edit page. In addition to that, users can also be assigned or removed from the group in this page. Groups can be deleted if it is no longer needed. You cannot delete the System Administrator group. Users can be assigned to the selected group there by assigning the permissions of the group to the users. Users can also be removed from the group if the user no longer needs the permissions of the group. Click on Remove next to the user in the group edit page to remove the user from the group. Check the Manage Permissions section to learn how to manage permissions to a group.